The region’s success is linked to the strength and character of its communities. Building community resilience and capacity requires strong networks between communities and with key centres in adjoining regions, states and beyond. The region enjoys many competitive advantages and community assets, such as cultural and heritage attractions, its lifestyle and environment, and specialised services and products. Over the next 20 years, changes to agricultural productivity, freight and transport connections, water trading and regulation, climate and economic conditions, as well as varying degrees of population change could reshape the communities of the Far West. Bourke and Central Darling local government areas and the Unincorporated Area will see a slight increase in their population, with other local government areas expected to see numbers stabilise or slightly decline.36 These numbers do not reflect the dynamic nature of many communities with high levels of transient workers, tourists and populations that fluctuate at different times of the year. A changing population increases demands on health and aged care services, education and training, and public and community transport. It also presents opportunities. For example, demographic shifts can be the impetus to improve the design of seniors housing, social housing, Aboriginal community housing and accommodation for seasonal and itinerant workers. Improving coordination and collaboration will strengthen local leadership and proactively address the challenges ahead. Proactively planning for change will benefit communities. An ageing population requires shifts in the way health and leisure, information technology, tourism, recreation, housing, and home services and support are planned so that seniors remain healthy, productive and engaged in their communities. Similarly, younger people can be encouraged to remain in their communities with better services, education and employment opportunities. There are many successful examples of collaborative partnerships and innovative solutions to meet the challenges of demographic change and service delivery. The work will be ongoing as communities continue to change. The NSW Strengthening Rural Communities Resource Kit (2001) can enhance community capabilities and self-sufficiency. This kit will be updated to reflect challenges such as the ageing population and a decline in the younger adult population. The NSW Government’s NSW Drought Strategy (2015) assists rural communities that are vulnerable to climate-related economic downturns by improving their business, reducing risks and building resilience to future droughts. The Strategy delivers a more transparent and targeted system of drought support. 20.1 Update the Strengthening Rural Communities: Resource Kit as a resource for councils to help rural communities build capacity and resilience. 20.2 Undertake modelling with local communities to better understand the implications and factors contributing to population change. 20.3 Build drought resilience in rural communities by providing targeted support to primary producers and communities to improve preparedness and decision-making. The Far West has many dynamic relationships across local government and state boundaries. These relationships create broader communities of interest based on unique social and economic links and the potential for a more diverse economy. Well-established communities of interest will be leveraged between Bourke, Brewarrina, Walgett, Cobar and the Orana, particularly with Dubbo as the primary service centre for many of these communities. These councils will strengthen their organisational relationships and associations with the Orana Regional Organisation of Councils (OROC) and Regional Development Australia (RDA) Orana NSW to share information relating to the planning and delivery of infrastructure, policy-making and government initiatives. Several settlements along the Murray neighbour twin settlements in Victoria (Wentworth and Mildura, and Balranald and Swan Hill). These communities are subject to different laws, policies and service delivery models which influences each community’s role, function, lifestyle options, and competition for housing, employment and investment. People will continue to move between settlements in these communities; for example, some people work in NSW and live in Victoria and others work in Victoria and access services in NSW. Infrastructure networks, including road and rail bridges and ferry crossings, are critical to these relationships and cross-border flows. An ongoing relationship between the demand and supply of land and housing, particularly in Wentworth and Mildura, will continue as both centres operate within the same housing market and have similar requirements for infrastructure and servicing. Matching future investment incentives between the states could produce complementary development outcomes in cross-border settlements. 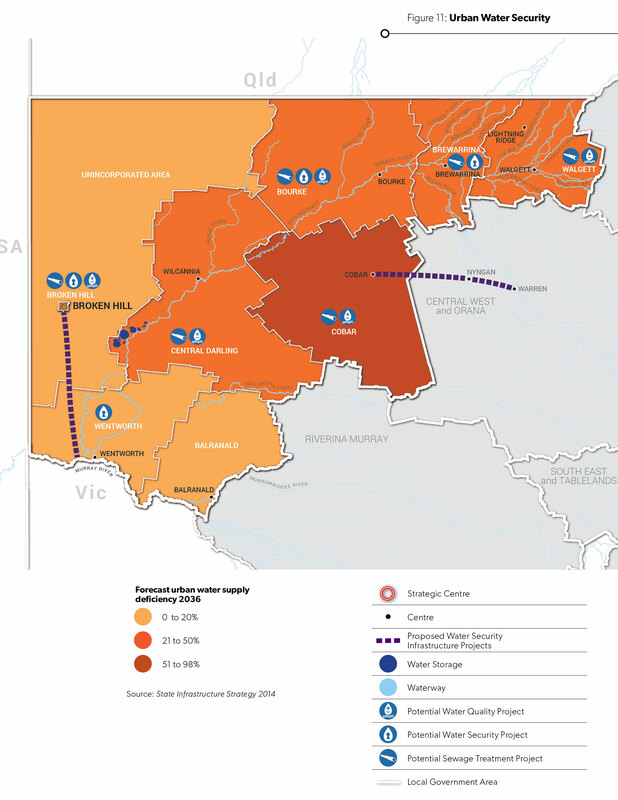 Road and rail connections from Broken Hill to South Australia create a valuable cross-border relationship, borne primarily out of proximity to Adelaide. This will continue to develop and include remote settlements in the Unincorporated Area that rely on Adelaide for higher-order services. Leveraging the tourism route from Adelaide to Broken Hill, Wilcannia and Cobar will benefit many communities. Communities near the Queensland border also connect through freight movements and the tourism route from inland Queensland to Broken Hill and Wentworth. Continued investment in the Barrier Highway linking Adelaide to Brisbane via Broken Hill will facilitate greater freight and tourist movements. In January 2017, the NSW and Queensland Governments signed a landmark agreement to deliver better services for communities near the border. The agreement signals a clear intent for greater regional collaboration to enhance economic development, align services, share information and improve cross-border transport routes. The communities of Lightning Ridge, Walgett, Brewarrina and other smaller settlements enjoy cross-border relationships with Queensland, which will be leveraged to forge better outcomes for the region. Councils will need to consider cross-border strategies, including land use, infrastructure and tourism, when planning for their local community. infrastructure delivery, including transport infrastructure. 21.2 Work with the Victorian Government and adjoining Victorian councils to develop a cross-border land and housing monitor. 21.3 Investigate opportunities to standardise development standards in NSW and Victoria, focusing on seniors housing and affordable housing developments. 21.4 Work with the Cross Border Commissioner to make travel across the NSW border easier and more convenient. 21.5 Implement key initiatives from the Statement of Principles and Priorities for Cross-border Collaboration 2016-2019 to improve service delivery to Far West communities near the Queensland border. 21.6 Consider cross-border land use, infrastructure and tourism strategies when planning for the region. 21.7 Enhance the twin town role of Wentworth and Mildura through collaborative land use planning, including opportunities to increase housing in Buronga. Aboriginal communities connect to their ancestral country by passing down histories and place awareness through generations. Consultation and partnerships with Aboriginal communities on future land use planning must acknowledge, respect and consider the views and interests of Aboriginal people. Local housing strategies and local environmental plans should be prepared in consultation with Aboriginal communities. Aboriginal communities can be empowered, through collaborative and inclusive planning, to identify their own issues, strategic directions and solutions. This will build trust and integrity within the community and requires mechanisms that acknowledge the diversity of communities and the resources needed to participate. Aboriginal communities have distinct housing requirements. Homes should be designed to meet cultural needs and climatic conditions and be planned in consultation with local Aboriginal communities. New housing also needs to be designed to cope with temperature extremes, heavy rainfall, droughts, bushfires and flooding. Design should incorporate passive solar access, water-efficient features and thermal qualities to contribute to affordable long-term housing options, lower energy costs and a more comfortable and sustainable lifestyle. Future housing delivery programs should also seek to engage local skills and tradespeople. 22.1 Develop partnerships and engagement protocols with Aboriginal communities during the planning process. 22.2 Engage Aboriginal communities during the preparation of local housing strategies and local environmental plans. 22.3 Work with stakeholders, including Aboriginal housing providers and prescribed body corporates, to identify opportunities for social and affordable housing options to meet the distinct cultural needs of Aboriginal communities. Health services must meet the needs of remote communities, including Aboriginal people, people with a disability, the disadvantaged, young people and families. Community-based health care and the roll out of e-health initiatives and distance education to smaller and isolated communities are examples of integrated service delivery. Investments in existing public health facilities can drive the development of complementary health services that meet community needs and support local employment. Ongoing and equitable access to aged care services will help smaller regional communities retain and potentially grow their population and enable people to stay in their homes as they age. Older residents need homes that allow them to retain a connection to their community and transition into higher-needs care if necessary. Tailored seniors housing close to town centres will make best use of existing infrastructure and services and allow residents to downsize to smaller, more manageable homes close to the services they require. State planning policies streamline approval processes for seniors housing. The incentives in these policies need to be reviewed to better suit regional circumstances. Often, they do not deliver benefits due to higher development costs and lower demand, as facilities need to cater for smaller populations compared to metropolitan areas. 23.1 Where practical, promote opportunities to establish health precincts around hospitals and encourage opportunities for development of complementary services. 23.2 Identify and plan for multipurpose, flexible and adaptable health infrastructure that responds to changing and emerging community needs. 23.3 Improve access to health facilities for cross-border communities through better transport connections. 23.4 Minimise the encroachment of inappropriate and incompatible land uses near existing and proposed health facilities. 23.5 Remove planning barriers to provide a range of low-care and independent seniors accommodation options. 23.6 Review the State Environmental Planning Policy (Housing for Seniors or People with a Disability) 2004 to make it more applicable for developers in regional areas. 23.7 Provide opportunities for retirement villages, nursing homes and similar housing for seniors in local land use strategies. 23.8 Locate new housing for seniors close to existing services and facilities, and on land free from hazards, including floods and bushfires. 23.9 Promote ageing in place by adopting relevant components of Livable Housing Australia’s Livable Housing Design Guidelines in development controls for Ageing Population Forecast housing, where possible. As the economy and population profile changes, so too will demand for skilled workers, particularly in the health, education, manufacturing, mining and renewable energy sectors. The semi-arid climate has traditionally fostered an agricultural and mining economy; however, emerging industries, such as cultural tourism, provide more diverse employment opportunities, particularly for Aboriginal communities. With the support of the NSW Government, local training can build the skills necessary to improve employment options and increase opportunities for social participation. New economic developments, such as the Bourke abattoir, can offer training for local people. Training must align with regional employment opportunities. Education and training providers may partner with government and private industry to tailor training programs, including vocational training and retraining opportunities. For example, the Broken Hill Royal Flying Doctor Service base offers training for medical and health science students in partnership with the University of Sydney, and provides essential remote health services. Expanding online access to tertiary and distance education will be vital. Other opportunities include harnessing transferable skills across different industries, and providing greater incentives to attract and retain skilled workers, including housing, travel and holiday leave. Attracting and retaining skilled professionals, such as general practitioners, tradespeople and training providers is difficult, due to the long distances and often limited and expensive transport options. Remote communities obtain specialised services from Broken Hill or Dubbo, with some communities accessing services from Mildura and Adelaide. Most primary health care services are provided on a visiting basis to local service centres only. Limited internet connectivity is a major constraint to distance education. The National Broadband Network is a priority for education, health and emergency services, agribusiness, mining and tourism. The NSW Department of Education is reviewing its approach to asset and network planning through a strategic plan to 2036 to identify schooling needs and improve education delivery. Managing declining enrolments while providing infrastructure to improve education delivery is a challenge. Resource pooling and cost-sharing between schools and councils will be explored to make the best use of community assets. 24.1 Remove barriers to the access and expansion of the education and training sector. 24.2 Work with councils, industry, research institutes, and education and training providers to align skill shortages with tailored regional training programs. 24.3 Facilitate joint venture opportunities for shared community/school facilities on school sites. Public and community transport services connect people to jobs, housing and services including health care and education, both within the region and with centres in adjoining regions and states. These services are an essential and affordable mode of transport for remote communities, offering regular connections to vital services for older people. The remote White Cliffs community in the Central Darling local government area, for example, needs greater access to community transport to support its ageing population. This is similar for many remote Far West communities. The NSW Long Term Transport Master Plan noted that the western region has the highest per capita use of community transport in regional NSW. Community transport providers need to identify and plan for future community transport needs. The development of Transport for NSW’s Future Transport Strategy will involve comprehensive engagement with the community and industry across NSW. The first stage of this engagement will focus on rural and regional NSW and include a combination of activities with local entities and across coastal, inland and remote locations covering regional cities, centres and towns. This engagement is taking place during 2017. 25.1 Investigate opportunities to improve bus operations in strategic centres and local service centres and their connections with regional communities. 25.2 Work with local transport operators and community transport providers to investigate delivery models for flexible and reliable transport, suited to the distinct needs of each community. 25.3 Prepare strategies to better link the region’s towns and villages to strategic centres and other major centres. Reliable and clean water supplies are critical to maintain liveability, attract new residents and support economic development. Securing adequate and reliable water supply for communities is a major issue for the Far West. Local water supply and sewerage services are provided by councils as well as a NSW Governmentowned corporation in Broken Hill. The costs associated with servicing water infrastructure can be a major barrier to maintaining and upgrading water supply treatment facilities. For example, securing funding to replace and upgrade the water reticulation system in Cobar will be critical to improving future water quality. Even with investment in water security infrastructure, innovative and adaptive measures will still be needed, given the potential effects of climate change. Water is not only a social and environmental issue for Aboriginal communities, but is reflected in their native title rights. Native title holders have an obligation under their traditional laws and customs to protect the environmental and cultural integrity of water sources within their country. Water security initiatives need to respect the native title rights of Aboriginal communities by ensuring water quantity is sufficient to maintain cultural flows and other uses. Establishing partnerships and sharing the cost of capital between communities by collaborating with the prescribed body corporates of native title holders, local industries and councils may overcome barriers to water security. In 2016, the NSW Government appointed WaterNSW to build, own and operate a 270-kilometre pipeline from the Murray River to Broken Hill. Scheduled for completion by 2018,39 it is part of a $500 million strategy to ensure that Broken Hill and nearby communities have a secure, long-term supply of water. The project will contribute to water recovery targets under the Murray–Darling Basin Plan, and will help irrigation industries across the State. The replacement of 130 kilometres of existing water pipe from Nyngan to Cobar has to date received funding of $17.1 million, funded partly from $10 million of Resources for Regions program and $7.1 million contributed by Cobar Water Board. Funding is still required to replace 100 kilometres of remaining pipeline. $10 million has been allocated to construct water storages on the Bogan River at Nyngan as part of the water security project to secure Cobar’s water supply. 26.1 Protect the Broken Hill pipeline corridor to deliver a secure long-term water supply to Broken Hill and its surrounding communities. 26.2 Adopt an integrated approach to water cycle management across the region. 26.3 Investigate ongoing water supply issues and collaborate with stakeholders to deliver long-term water security for residents and industries, including funding works from the Water Security for Regions program. 26.4 Investigate supplementary water sources for town water supply during periods of drought. Increased housing choice with diverse tenure, design and configuration will improve affordability, help meet the needs of an ageing population and support the trend for smaller household size. Local housing strategies identify housing needs, plan for a range of housing types and identify the infrastructure needed to support local communities. The strategies need to be flexible and responsive to shifts in demand and supply and deal with uneven rates of development or unexpected population growth. Infrastructure must be planned for and provided prior to the construction of new housing. Even in areas with stable populations, demand is still likely for new dwellings, as the number of people living in each household will decrease. Where it is no longer viable to maintain existing dwellings, there is also likely to be demand for new dwellings. This presents difficulties, in that some centres will have to access building and construction tradespeople from neighbouring areas. In mining communities such as Broken Hill and Cobar, demand for housing fluctuates, with high demand during mining construction phases. These workers need a range of accommodation options. Any undersupply increases rents, affects affordability and may cause health and safety issues from overcrowding and makeshift housing. It can also put pressure on tourism and visitor accommodation, such as motels, caravan parks and camping grounds. Transient populations put pressure on housing and accommodation supply. Peaks in housing demand may be satisfied through short-term workers accommodation in temporary housing villages. Further guidance is required to plan for temporary mining accommodation. The size and scale of these facilities should be decided with local communities and consider social integration, land use conflicts and impacts on community facilities. Temporary housing provides short-term accommodation for construction and mining employees during peak periods. Remote temporary housing villages should avoid duplicating services and facilities in existing townships. In some circumstances, locating temporary populations on the outskirts of established centres may be preferable to enable temporary residents to use and contribute positively to facilities that serve the entire community, while better integrating temporary workers into these communities. 27.1 Review planning controls in existing town centres to increase housing options in centres and locations close to services and jobs. 27.2 Align infrastructure planning with land release areas to support new developments with adequate infrastructure. 27.3 Locate multi-dwelling housing developments close to town centres and villages to capitalise on existing infrastructure and to provide a greater choice of housing close to services and amenities. 27.4 Produce guidelines to help councils plan for and manage seasonal and itinerant worker accommodation. 27.5 Prepare planning guidelines for the shortterm accommodation of mining employees to support workforce needs during mining construction, operation or shutdown. Providing housing that meets the needs of residents on a range of incomes can address housing affordability and social housing issues and help reduce social disadvantage. Housing needs to be affordable to enable many of the region’s low-income households to enter the housing market. promoting caravan parks and manufactured housing estates on unconstrained land in existing settlements and new land release areas. Councils can identify appropriate sites that meet the needs of residents and tourists through their local planning strategies. There is a significant amount of public and community housing in the region. Overcrowding is an issue in some communities, including in Brewarrina where close to 10 per cent of homes were occupied by six or more people in 2011. Overcrowding can lead to social problems and poor health, education and community wellbeing. 28.1 Promote incentives to encourage greater housing affordability, including a greater mix of housing in new release areas. 28.2 Prepare planning guidelines for local affordable housing needs in local housing strategies. 28.3 Promote a range of housing types and affordable housing options in local housing strategies. Some people are looking for a semi-rural lifestyle, and a larger block of land than is generally available in urban areas. Demand for rural residential living is higher in areas close to waterways, such as the Murray and Darling rivers. Rural residential development can conflict with agricultural, industrial or resource lands. It may also increase pressure for new services outside existing settlements, with costs borne by councils and the broader community. Managing this development and its cumulative impacts will be essential as the regional economy diversifies and development pressures increase. A consistent planning approach is required to identify suitable locations for new rural residential development to avoid fragmentation of productive agricultural land and protect high environmental value assets, cultural and heritage assets, or areas with important rural landscape values. Rural residential development should not increase pressure on infrastructure and services and should be located on land free from natural hazards. 29.1 Provide opportunities for rural residential development only where it has been identified in a local strategy prepared by council and approved by the Department of Planning and Environment. 29.2 Ensure the design of rural residential areas respects the semi-rural character of the area. to avoid areas of high environmental, cultural and heritage significance, important agricultural land or areas affected by natural hazards. 29.4 Manage land use conflict that can result from cumulative impacts of successive rural residential development decisions. Good urban design can create safe, healthy and socially inclusive places that meet the different needs of children, young people, families, singles, people with a disability and seniors. When planning and redeveloping town centres, decision-makers need to consider how design and the environment influence the way people walk within the centre, landscaping requirements and infrastructure for public places. New and existing development should provide opportunities for walking and cycling, where appropriate. Councils need to promote water sensitive urban design techniques that will improve water use planning, supply and security. Wastewater can be re-used on parks, gardens and reserves, or can supplement agricultural uses. The Far West can lead the application of water sensitive design techniques. Urban design guidelines are commonly developed with a metropolitan focus and do not apply to regional and rural environments. Regional urban design guidelines will assist councils as they prepare environmental planning instruments for new development to revitalise town centres and to respond to climate and water security challenges. 30.1 Enhance the quality of neighbourhoods by providing and promoting accessible, adaptable and well-connected open spaces that support physical activity, including recreational walking and cycling networks in the design of new communities. 30.2 Develop regional urban design guidelines for planning, designing and developing healthy built environments in the Far West’s unique climate. 30.3 Incorporate water and climate sensitive urban design in new developments and when revitalising town centres. 30.4 Design new housing developments to reflect the local and distinct built form, heritage and character.